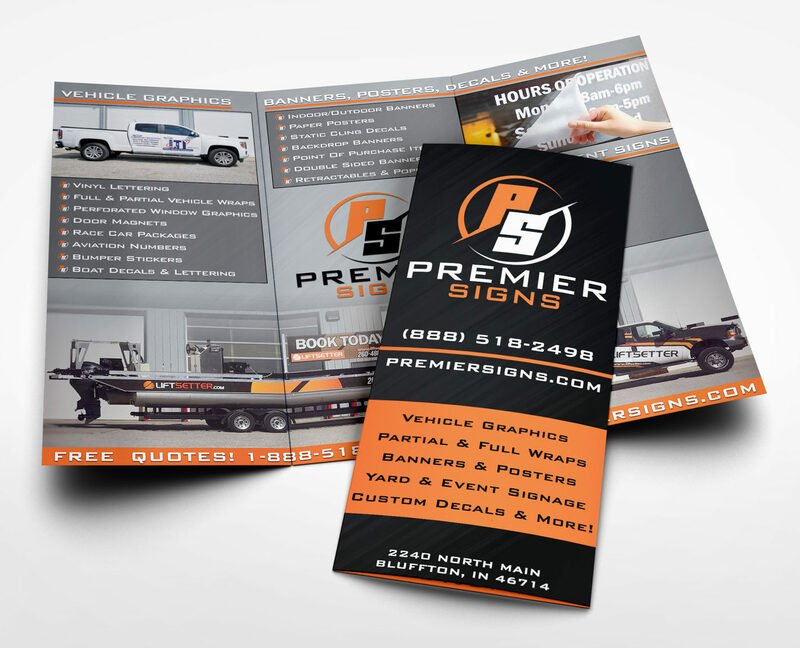 Premier Signs | Bluffton, IN – Make an impression that sticks! Make an impression that sticks! Premier Signs in Bluffton, Indiana offers indoor/outdoor solutions to any sign need you may have. We will use our expertise to find the right answer for your project and your budget. Call us at (888) 518-2498, or e-mail info@premiersigns.com and we’ll take the first step in starting your project by providing a free quote. Our team utilizes the latest Adobe Creative Suite package and top of the line products from companies like 3M, Avery Dennison, and Hewlett-Packard, ensuring a high quality finished product. We’re able to offer indoor/outdoor solutions to any sign need you may have. From large format digital printing on a variety of materials to simple one color vinyl work, we do it all. Making you look good is our job, and we take it very seriously. Offering Bluffton, IN and the surrounding area signs ranging from large format digtal printing on a variety of materials including banner, posters, and perforated window mesh to vinyl lettering, vehicle wraps, and point-of-purchase items, we’re able to offer both indoor and out solutions to any sign need you may have. Signs – it’s what we do.